I had nice sunny weather today, folks. Sunny weather! I went out and worked on holes for the berry bushes we want to put in, and was in a generally good mood. GROUND TEMPERATURES...BUT SIX INCHES OR MORE OF SNOW IS POSSIBLE OVER MUCH OF NORTHERN AND CENTRAL WISCONSIN. LESS IS EXPECTED IN THE FAR NORTHCENTRAL PART OF THE STATE SINCE IT IS FURTHER AWAY FROM THE STORM SYSTEM. LIGHTER AMOUNTS MIGHT ALSO OCCUR NEAR LAKE MICHIGAN IF THE SNOW MIXES WITH OR CHANGES TO SLEET. At least the dog will be happy. He really likes the snow. Over the past few days I finally managed to finish sheet mulching my expanded garden area. Spinach, chard, carrots, and some extra snow pea seeds have all been sown as well. However, since Sunday's storm went through the state the weather has turned cold again. This past week we have only been creeping up to about 5-6 degrees C most days. Then last night we started getting mixed rain and sleet coming down. Prior to this weather event I'd been trying to cover my sprouted snow peas on those nights when it was going to freeze, but I didn't get out and cover them last night. This morning we had close to an inch of snow on the ground, and I have no idea if the snow pea starts will survive this. I am thinking (hoping) they will. The weather isn't quickly fluctuating between freezing cold and warm, which is what generally causes frost damage. So I believe they should pull through this. This cold is also killing my soil temperature. The soil is still thawed, but unless things start to warm up just a little my seeds are not going to want to sprout which will delay my garden developing for a few weeks. I would really like things to move along so crops will be ready to rotate in June when I'll start putting in my squash, tom and pepper plants. Merrill, WI, located in Lincoln County, is about 40 miles away from my current abode. The storm that flooded my garden Sunday generated a tornado that went through portions of that small town. From what I am reading in various small town news, 65 homes were damaged around Lincoln County, three people were sent to hospitals with injuries, but no deaths were reported. The tornado, initially listed as an "EF2", was later upgraded to an "EF3" on the Enhanced Fujita scale. In total there were 10 confirmed tornadoes generated across Wisconsin; a state record for the most in one day for the month of April. We had a big thunderstorm roll through the area last night and it put down a good amount of precipitation. Annoyingly, I didn't have my rain gauge out so I don't know how much, exactly, came down. That said, there was enough rain that the section of the garden I had dug out the day before to turn the soil had filled up with water. There's a lot of standing water around the yard today. Luckily our basement has stayed dry. The soil here is about 80% silt, so it should drain quickly enough over the next few days. However, all this water also means my work on expanding the garden is going to be held up a little bit. 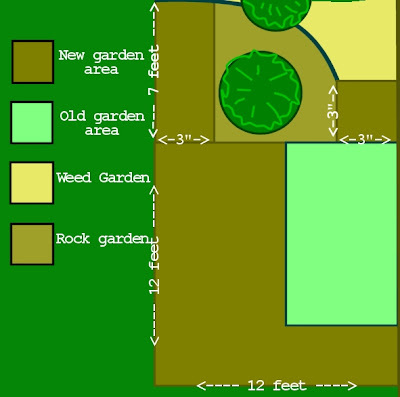 With the soil that muddy it just tends to get compacted when it is moved around, and compacted soil is not good for most plants. My pea sprouts seem to have handled the transition outside and the rainstorm pretty well. I'm still terrified that I am going to come out one morning to discover that they were made into a bunny's late-night snack. I've read that if I can get them past the sprout stage rabbits tend to leave them alone, so here's to hoping they'll grow a little quicker; the rabbits have really been out and about in the neighborhood of late. After a late spring I am finally getting a start on my garden. This means that my dear readership will be getting a few more posts of my puttering around my yard like the old man that I pretend to be. The main thing I need to get done is expanding my garden. Last year I had a garden that was roughly 50 ft² and just grew peppers, cucumbers, and tomatoes. This year the garden is getting expanded out to 174 ft², but that means I am having to turn over a lot of soil to get the area ready. It is also the first year I'll be doing a spring crop, so I am hoping everything goes smoothly. It doesn't look like much yet. I just hope the neighbors don't complain about the mess. The past couple of days have had good sunny weather so I got to work staking out the garden expansion. I broke down a big cardboard box that was lying around and decided to use it as a partial cover for the garden. Currently I have about half the area turned over, but finishing that particular task might take a while longer as a storm system has rolled into the area for the weekend. I'll have to wait for the soil to drain again before I start trying to turn the remaining area.. I did get my chard and snow pea seeds into the ground yesterday. I also had some snow pea starters in some jiffy pots that went into the ground as well. The chard is covered with cardboard until the start to sprout, and then I'll remove that cover and mulch them with straw. I also have spinach seeds I need to sow, but I've decided to wait until the storm rolls out of the area before I take care of that. 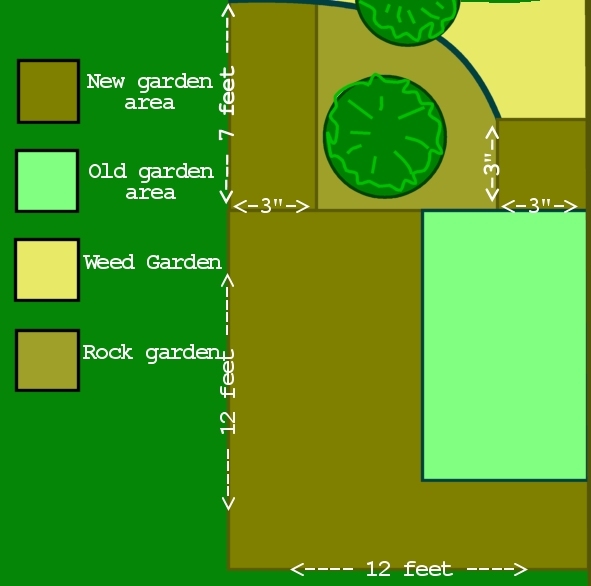 I also think we have decided to try planting some blackberries and rasberries to the north of the garden in the so-called "weed-patch." I was somewhat concerned about how to keep berry bushes from taking over the area since they tend to send out a vigorous network of runners, but some research into the issue lends me to believe that I should be able to control that problem with a solid set of 10-inch deep root-barriers around the bushes. Of course, this means more digging, but luckily that is a task I do enjoy. It would seem my coverage of natural disasters has made some of my readership a little depressed and filled with an anxiety that the world is a cold cruel place that can kill us at a moments notice. To bring some levity back to the blog here's a video of my dog, Sheridan, playing in the snow. Tomorrow, or perhaps the next day that follow that, back to the drang und sturm. A family caught on video a large ice-flow making its way down the Mississippi river near the town of Wabasha, MN. The ice-flow was large, heavy enough, and close enough to the shore to destroy what appear to be several private boat launches. According to the Army Corp of Engineers the ice flow broke loose from Lake Pepin. It hit the Highway 60 bridge, causing no structural damage of note. The bridge strike rotated so that it reached from one bank to the other as it was carried down river past Wabasha. The Mississippi river near Wabasha was reported as being 13 feet April 2, 1 foot above the area's 12 foot flood stage. Minor flooding was reported. Call 911 and then throw the phone away. It might sound like a ridiculous plan to get rescued, but for one woman in Florida her lucky phone toss led to her rescue. The woman, Carla Chapman of Plant City, Florida was working in her backyard when she fell through the surface and into a sinkhole. She had her cell phone on her, but the sinkhole created terrible reception and she kept getting disconnected when she tried calling for help. Finally she got the idea to dial 911 and then throw her phone up out of the hole back into her yard where there would be a cleaner signal. The gambit worked, the 911 call went through, and a police officer responded to her home, eventually finding Carla trapped in the backyard sinkhole. Additional rescuers were summoned and they worked to get her free. As an added twist to the story, this wasn't first time Carla got trapped in a sinkhole in her backyard. In 2010 another sinkhole on the same property also tried to swallow her but she was fortunately rescued by a neighbor. The Lazy Geographer is a sedentary soul and long-time net surfer who never really understood this whole blog thing. As such, he only occasionally remembers to throw things in here for no one in particular to read. He like volcanoes because they are sparkly, less so vampires.